Spread from Le Petit Néant issue two showing a piece by Gabriel Leger, whose work re-appropriates Russian documents and imagery from the postwar period. 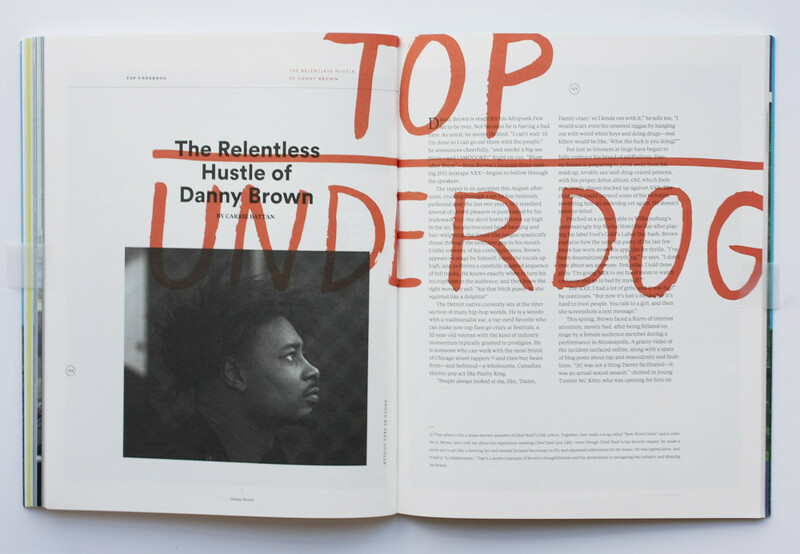 Top: spread from The Pitchfork Review featuring a photograph by Erez Avissar. Le Petit Néant is a saddle-stitched soft cover largely wordless publication filled with mostly black and white illustrations. An insert by David Crowley explores concepts from Austrian writer Peter Handke’s dream-like novel Absence – books are all-consuming; they ‘digest’ the reader, twist time and put reason on hold. 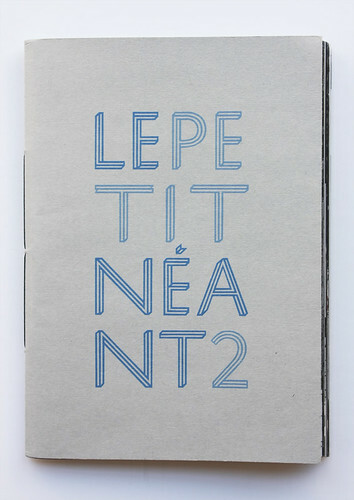 As a byproduct of this wordlessness, contributors to the second issue of Le Petit Néant go almost uncredited – their names are hidden in list format on the inside flaps of the front and back covers. Illustrators and artists featured include Andrzej Klimowski, Chris Bianchi and Tilo Baumgartel. The name translates roughly as ‘The Small Nothingness’. See Elizabeth Glickfeld’s ‘Busy doing nothing’, about the first edition, on the Eye blog. 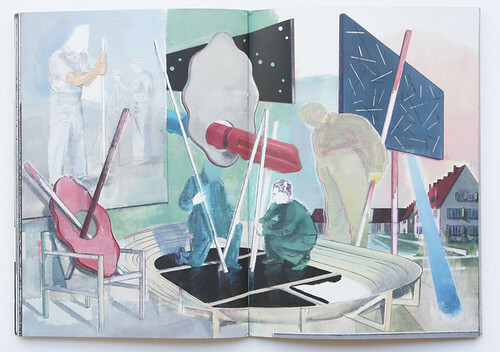 Le Petit Néant #2: spread showing drawings by Andrzej Klimowski (see ‘Theatre of dreams’ in Eye 16). Le Petit Néant #2 cover. 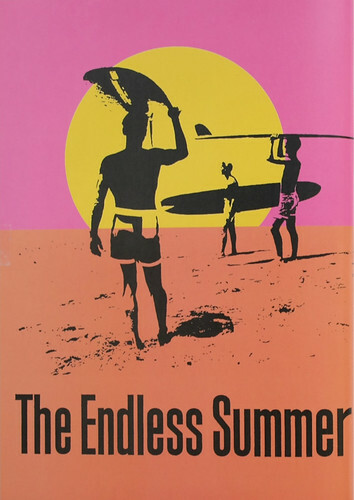 Film poster for The Endless Summer, designed by John Van Hamersveld. Typolitic publishes typographic work by undergraduate students, worldwide alongside with comments solicited from experienced commentators including Eye founder Rick Poynor, Pierre Bernard and Ellen Lupton. ‘Whether practical or speculative, these projects may be the seeds of emancipatory practice,’ states the Typolitic site. The Pitchfork Review. Design: Joy Burke and Molly Butterfoss. 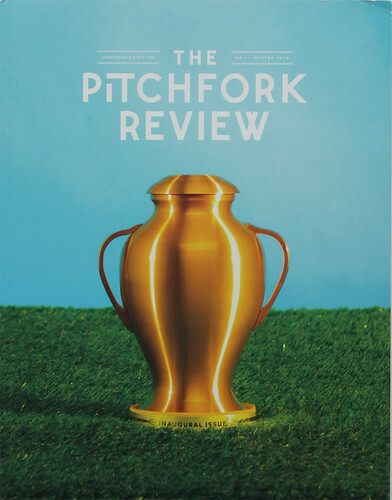 The inaugural printed issue of The Pitchfork Review comes after seventeen years of online-only publication at pitchfork.com. The print edition aims introduce readers to articles once ‘lost to Google searches and Twitter archives’. 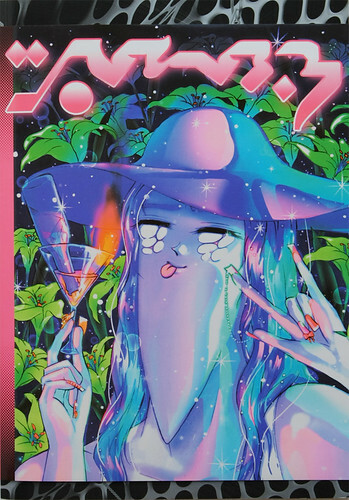 The quarterly Chicago-based magazine is designed by Joy Burke and Molly Butterfoss and richly illustrated by Michael DeForge, Sophie Goldstein and Sterling Texas among others. 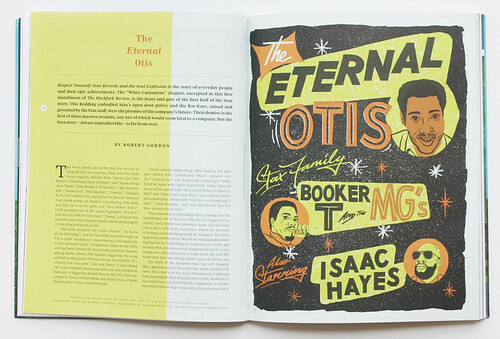 Spread from The Pitchfork Review. Cover of Mould Map, co-edited by Hugh Frost and Leon Sadler, Landfill Editions and Famicon Express. Cover illustration: Julien Ceccaldi. 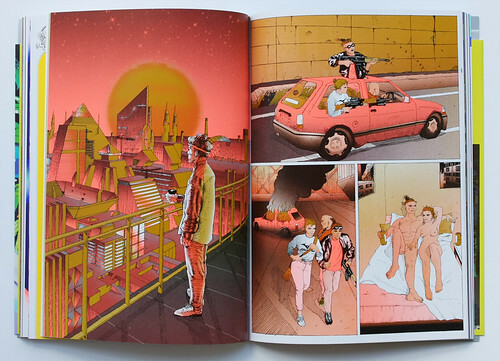 The Mould Map 3 (£40), co-edited by Hugh Frost and Leon Sadler, is part of a series of comics and narative art books published by Landfill Editions and Famicon Express. It is printed in London by Calverts in fluorescent inks on multiple paper stocks, and includes works by 40 wildly varied contributors including Åbäke, James Jarvis, Joseph P. Kelly and Metahaven. 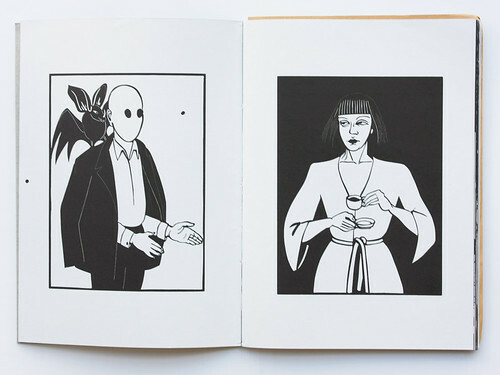 A six-page wordless narrative drawn by Joseph P. Kelly. 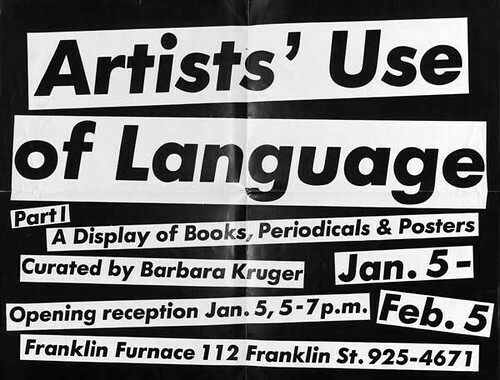 Small poster for the exhibition ‘Artists’ Use of Language’. ‘Please Come to the Show’ is an exhibition of printed ephemera curated by David Senior, bibliographer at The Museum of Modern Art Library. 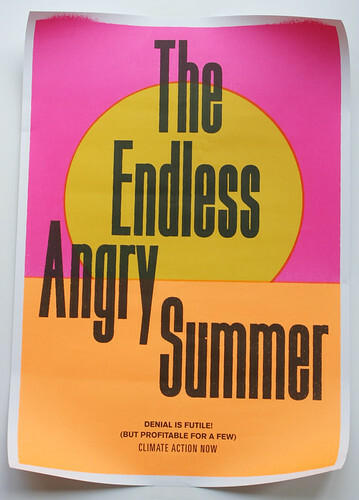 Designed by John Webster, the exhibition includes invitations, announcement cards, press clippings, small posters (see above) and flyers for art exhibitions from 1960 to the present, all of which are part of the MoMA Library collection. ‘Please Come to the Show’ continues until 16 May 2014, in the Exhibition Resource Centre at Liverpool John Moores University.